Do you need bat bug control and removal in the Richmond and Charlottesville ares of Central Virginia? Bat bugs are blood-sucking insect parasites that feed primarily on the blood of bats. Although bat bugs primarily attack bats, they can feed on any warm-blooded animal, including humans. Bat bugs are closely related to bed bugs, and are so similar in appearance that they are often mistaken for bed bugs. Examination with enhanced magnification is needed to distinguish bat bugs from bed bugs. A key physiological distinction between the common bedbug and the bat bug is the fringe hairs on the pronotum (the upper covering of the thorax), which are at least as long as the width of the bat bug’s eye, but shorter in the bedbug. Like bed bugs, bat bugs will also bite humans if given the opportunity. There are two main species of bat bugs: the Eastern Bat Bug and The African Bat Bug. Adult bat bugs are reddish-brown, flattened, oval, wingless, and about ¼ inch in length. Batbugs are wingless, and when viewing them from above they are oval in shape, but are flattened from top to bottom. A key physiological distinction between the common bedbug and the bat bug is the fringe hairs on the pronotum (the upper covering of the thorax), which are at least as long as the width of the bat bug’s eye, but shorter in the bedbug. Bat bugs are moderately common in the midwest US and have been recorded in Scotland, and are found in houses and buildings that harbor bats. Infestations in human dwellings are usually introduced by bats carrying the bugs on their skin. Bat bugs usually remain in close proximity to the roosting locations of bats (attics, chimneys, etc.) but explore the rest of the building if the bats leave or are eliminated. In some cases, they move into harborages that are more typical of bedbugs, such as mattresses and bed frames. Female bat bugs can lay more than 500 eggs in their lifetime. Development from egg to adult ranges from 2 weeks in ideal conditions (warm temperature and abundant food supply) to more than 15 weeks, averaging about 1.5 months. An adult may survive more than one year without feeding. As with the common bedbug, a nymph requires a blood meal to molt, and an adult female requires a blood meal to lay eggs. Each bat bug will molt, or shed its shell, five times as it grows. A blood meal is required each time it molts. If blood meals become scarce, bat bugs can slow their life process until a blood meal source is found. The saliva of a bat bug may cause a swelling on most people when they are bitten, but they do not leave a wound. Swelling may accompany redness in some people with bite sensitivity. A number of health effects may occur due to bat bugs including skin rashes, psychological effects and allergic symptoms. Controlling bat bugs requires the elimination of any bats that are present in the home or building. This is accomplished by exclusion techniques also known as “building them out” (i.e., sealing entrance cracks and holes). Residual sprays such as bifenthrin, lambda-cyhalothrin, deltamethrin, and beta-cyfluthrin sprayed into all cracks and crevices, especially light fixtures and window casings, may help to control the bugs. Killing bats is illegal in most jurisdictions. Bat bugs are related to bed bugs and unfortunately many pest control companies incorrectly identify bat bugs as bed bugs. Bat bugs are parasites that feed on the blood of bats. They are often found on bats, crawling around bat roost sites or in the bat guano (feces). We have also found them crawling along the floor in bedrooms that are just below their roost sites. To help you better identify what a bat bug looks like we’re in the process of posting a quality bat bug video . Q. I have bats in my attic and they are causing me to have bedbugs in my home. How do I get rid of bedbugs? A. 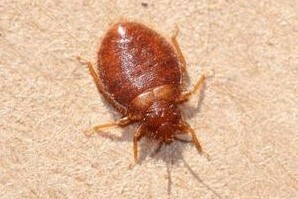 People with bat infestations often think that the small reddish or mahogany colored bugs they are seeing are bedbugs. They start to panic and anxiously search the internet for solutions on getting rid of bedbugs. The truth is you probably don’t need to know how to get rid of bedbugs. The bugs you are seeing in all likelihood are bat bugs. Bat bugs are parasitic bugs that live on and around places occupied by bats. Once bats are removed from your home, we can treat the affected areas to get rid of the bat bugs too. A. Yes, these two problems are related, but chances are you have Bat Bugs instead of Bed Bugs. Bat Bugs are a ectoparasite that be found on Bats, in guano, areas where there has been bat colonies, or around roosting areas where bats congregate. They look exactly like bed bugs, and only the trained eye can distinguish the two. Infestations can be very minor to very major problems. Once Bats are removed or happen to take up a roost elsewhere, ectoparasites like bat bugs can start searching throughout the home for a new host. If you notice activity like this, call one of our Virginia Bat Removal specialists immediately. Contact Us at (804) 729-0046 or toll-free at (888) 824-7383 for Virginia animal trapping, animal control, wildlife removal, pest control, animal capture, animal exclusion or wildlife management in VA. If you have a bat colony in your attic, call Virginia Professional Wildlife Removal Services today at and schedule a site visit for bat removal and bat control in Virginia. We can safely remove the bats from your home, and make sure that the bats do not return. We normally do not perform bat exclusions during the bat birthing period of May through August. There are exceptions, so call us for details. Call us for bat bug control and bat bug removal in the Richmond Va and Charlottesville areas of Central VA. We know how to get rid of bat bugs which are similar to bed bugs. We can kill the bat bugs to help keep them from biting you and your family. Bat bug control is our specialty.